While my husband and I were in Hawaii, I went kind of bananas at the roadside fruit stands (check out my fruit loot). I couldn’t get enough fresh pineapple! We even drove by the Dole Plantation, one of the few places where you can find Dole Whip, the world-famous pineapple soft-serve that fans line up for like it's Pirates of the Caribbean (seriously—Disneyland is another place that serves this magical dessert). I really wanted to stop and try the popular pineapple treat, but my husband took one look at the line that was wrapped around the plantation, locked the car doors, and floored it. 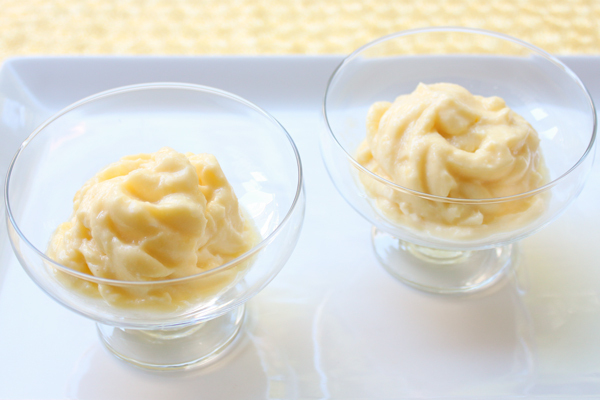 Luckily, one of my favorite blogs, Chocolate-Covered Katie, recently shared a healthy, homemade version of Dole Whip, and since I'm still daydreaming about Hawaiian pineapple, I made it immediately. 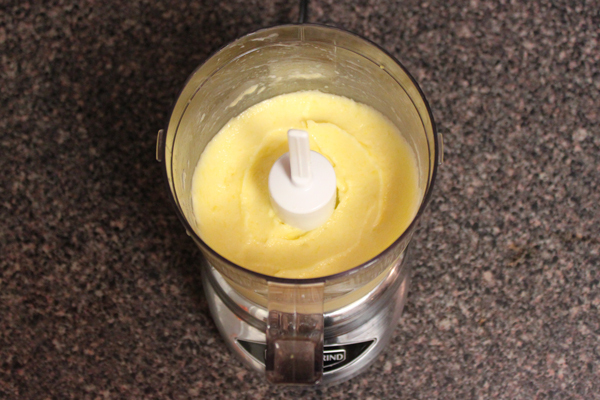 I followed Katie’s recipe, which calls for only five ingredients: frozen pineapple, your milk of choice, salt, stevia or sugar of choice, and lemon juice. 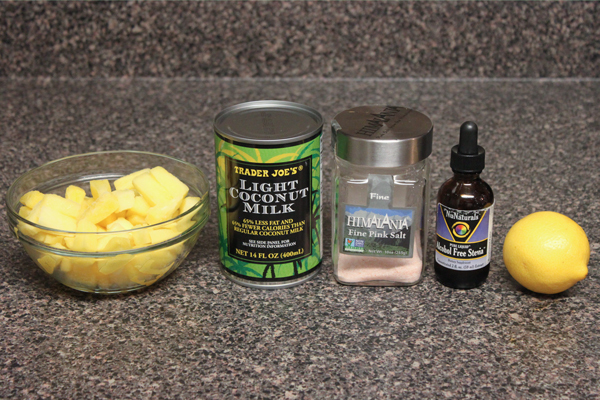 I kept this dairy-free (and extra tropical) with canned coconut milk (I like the canned kind from Trader Joe's since the only ingredients are coconut milk and water, while carton varieties usually list some things I can't pronounce) and added about eight drops of liquid stevia. While whipping up all of the ingredients in my little Cuisinart, I stopped to scrape down the sides a few times and about halfway through, added another teaspoon of coconut milk to keep things churning. It only took about a minute or two to get a nice, smooth texture. I’ve never had the original Dole Whip, but I don’t think I need to because this version totally satisfies my cravings for a sweet, tropical treat. 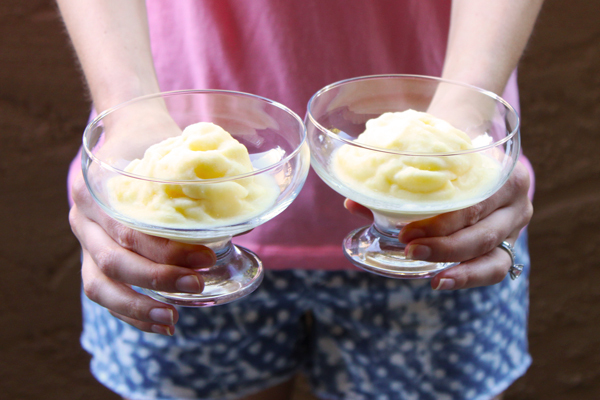 Perfect for hot, summer afternoons, each spoonful tastes like vacation and is filled with good-for-you pineapple and coconut. For the full scoop (yup) on how to whip this up at home, check out the recipe here. Yum! Would love to try this! Ironically, I just bought frozen pineapple! I didn't have coconut milk, but I substituted a dash of coconut/caramel flavored coffee creamer and some unsweetened shredded coconut and it turned out delicious! Yes! I love doing this, too! It's so good with peanut or almond butter! 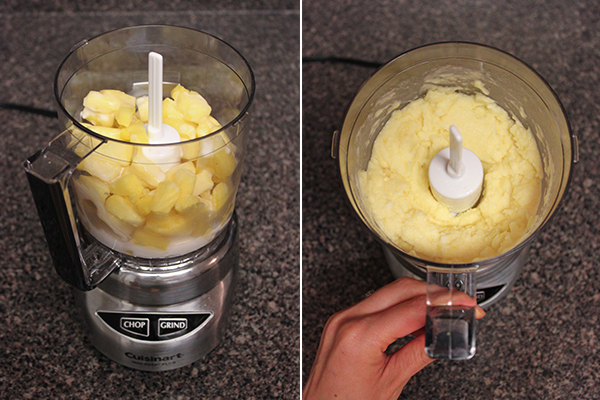 Just think, now your food processor is kind of like a mini fro-yo machine! Dream come true! Katie, thank YOU for creating such an amazing recipe, and a huge hug and thank you for stopping by! I keep hearing about dole whip- I'm so excited that I can now try it!! I know, I've been hearing about it for years, too! Now we can make it at home, no trip to Hawaii or Disneyland required! Yay! I might be the last person on Earth who hasn't tried dole whip! I will have to give this recipe a shot. it seems Bethann proof! I love your dishes, Julia!